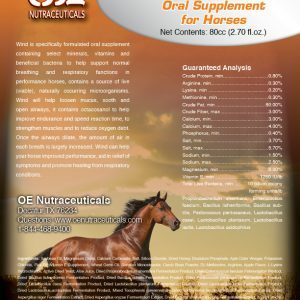 Composed is specifically formulated oral supplement containing a blend of select minerals and vitamins with probiotic bacteria Lac­tobacillus acidophilus to help support balanced behavior and healthy digestive functions in performance horses during traveling, shows, competition or other situations that may cause anxiousness, contains a source of live (viable), naturally occurring microorganisms. Composed improves focus and decrease anxiety for horses to perform at its optimum level. 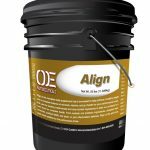 This is done through the ability to control stomach acid and discomfort that comes with increased anticipation of performance, the ability to focus the mind clearly on the task at hand without distraction, and continue to let the body perform at a high level through proper circulation and blood flow. Flex uses one of the highest levels of Hyaluronic Acid per dosage of any paste product on the market with MSM and Methionine. Flex is recommended to support the functions of joint and connective tissue; and maintain strong bones. Oral doses of Hyaluronic Acid at 100mg/day or more may provide relief from normal discomfort. 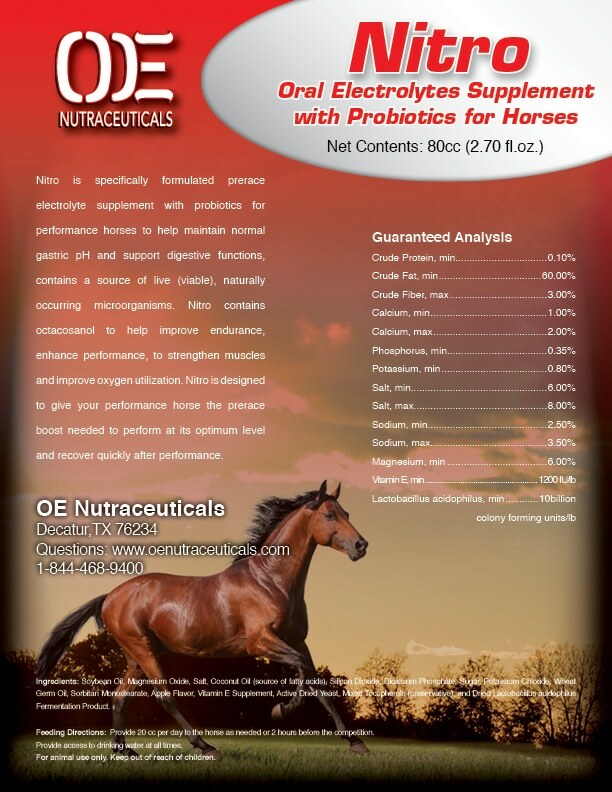 Gastro Shield is formulated with probiotics, digestive fibers and inulin, and select minerals to help maintain normal digestive tract and functions in performance horses. 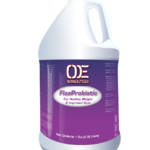 When given as directed, it helps maintain normal gastric pH, contains a source of live (viable), naturally occurring microorganisms. Case studies of acid reducers or Proton Pump Inhibition show that they can weaken bone strength when used over an extended time period. 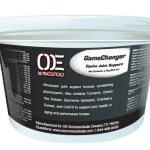 Gastro Shield uses multiple vitamins and minerals to reduce acid in the stomach, help protect the stomach lining, and strength bone structure. Nitro is specifically formulated prerace electrolyte supplement with probiotics for performance horses to help maintain normal gastric pH and support digestive functions, contains a source of live (viable), naturally occurring microorganisms. Nitro contains octacosanol to help improve endurance, enhance performance, to strengthen muscles and improve oxygen utilization. 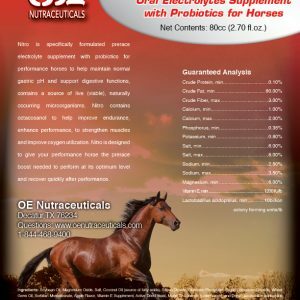 Nitro is designed to give your performance horse the prerace boost needed to perform at its optimum level and recover quickly after performance. 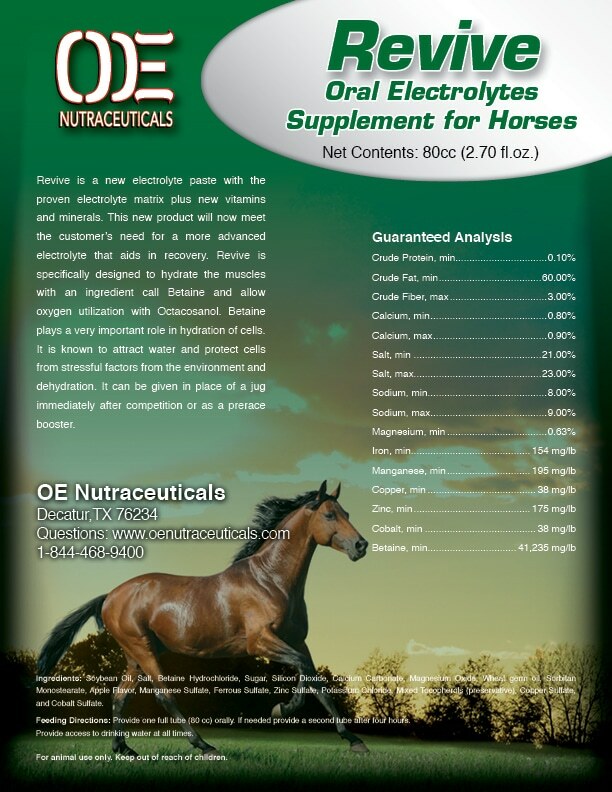 Revive is a new electrolyte paste with the proven electrolyte matrix plus new vitamins and minerals. 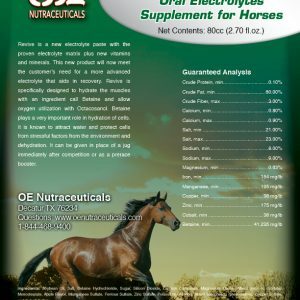 This new product will now meet the customer’s need for a more advanced electrolyte that aids in recovery. Revive is specifically designed to hydrate the muscles with an ingredient call Betaine and allow oxygen utilization with Octacosanol. Betaine plays a very important role in hydration of cells. It is known to attract water and protect cells from stressful factors from the environment and dehydration. 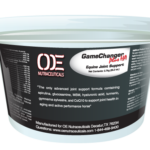 It can be given in place of a jug immediately after competition or as a prerace booster. 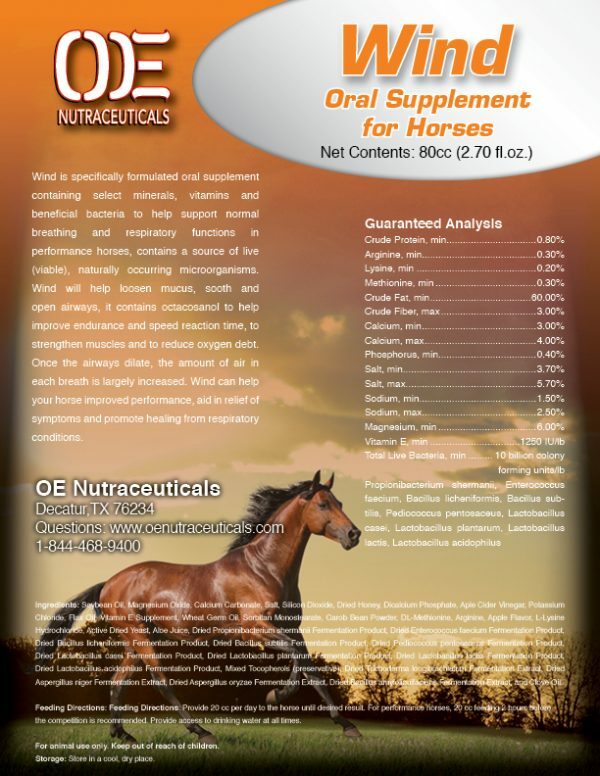 Wind is specifically formulated oral supplement containing select minerals, vitamins and beneficial bacteria to help support normal breathing and respiratory functions in performance horses, contains a source of live (viable), naturally occurring microorganisms. Wind will help loosen mucus, sooth and open airways, it contains octacosanol to help improve endurance and speed reaction time, to strengthen muscles and to reduce oxygen debt. Once the airways dilate, the amount of air in each breath is largely increased. Wind can help your horse improved performance, aid in relief of symptoms and promote healing from respiratory conditions.